As can be seen in the daily chart of the S&P 500 below, trading conditions for the US’s main stock index have changed dramatically over the last two months. Along with the Dow Industrials, NASDAQ and broader-based Russell 2000, the S&P 500 has advanced in a steady upward trend since Donald Trump’s election victory in November 2016. In fact, there’s been little in the way of a serious pull-back since the nadir of the financial crisis was hit back in March 2009. There was a wobble in 2011 as the European crisis built and then ebbed, and then the two Chinese devaluation-triggered sell-offs in August 2015 and early 2016. Aside from these, no appreciable pull-backs. Over the same period, volatility declined steadily leading to increased investor confidence and ever-greater leveraged risk-taking. All this was driven by coordinated central bank stimulus and their zero (or even negative) interest rate policies. This monetary largesse was unprecedented. It also appeared to defy economic logic as inflation (at least by conventional measures) remained subdued. This situation appeared to change at the end of January this year after US wage growth unexpectedly spiked higher triggering a surge in volatility. Bond yields shot up leading to calls that the great 35-year bull market in bonds was finally over. Investors were warned to prepare for higher borrowing costs – not just in the US but across the Euro zone and in Japan as well. Global equities tanked. But there was a sudden bounce-back as the immediate effects of the volatility shock subsided and a fresh update on Average Hourly Earnings suggested that January’s reported jump in wages was an outlier. Nevertheless, there are still plenty of factors which still have the power to unsettle investors and help turn sentiment negative. To start with, the outlook for inflation is unclear. It could continue to rise back towards the Fed’s 2% target although some analysts warn that it may have already peaked. This goes some way to explaining why the yield on the US 10-year Treasury remains rangebound – comfortably below the 3% “danger level” but still above 2.8%. Meanwhile, stock market volatility remains elevated. Not by historical standards, but when compared to levels seen over the last few years. This suggests that some normality is returning to markets, no doubt in response to the Fed’s recent rate hikes and as it begins to reduce its balance sheet, putting downward pressure on bond prices. Then there’s Trump’s introduction of trade tariffs and the fears of full-blown trade wars. These worries subsided over the weekend following emollient comments from US Treasury Secretary Steve Mnuchin and on reports that US and Chinese officials were working towards some form of trade compromise. This was the catalyst for the sharp bounce in equities yesterday and the follow-on rally this morning. However, there’s still the matter of the turnover of staff at the White House and last week’s appointment of John Bolton as National Security Advisor. Mr Bolton takes a hard-line stance on Russia and Iran and this has raised concerns of increased geopolitical tensions at a time when Russia is already facing global opprobrium. Rounding things off we have Facebook’s data scandal and the related sell-off in FAANG stocks to consider. Again, these tech leaders have recovered lost ground suggesting that we may have seen the worst of the selling. But on the other hand, it may be too early to sound the “all-clear”. Yesterday the Dow recorded its best one-day move since August 2015. Meanwhile the S&P 500 bounced back above its 200-day Exponential Moving Average (EMA) and is now closing in on the 100-day EMA, around 2,680. So, what now? Well the next two weeks could prove crucial in setting up markets for their next big move. 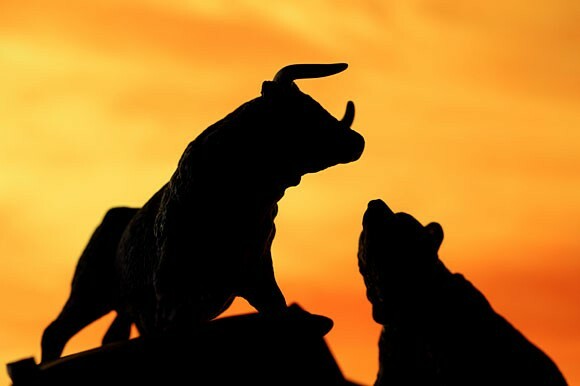 Investors will be keeping a close eye on technical levels to see if the S&P can get back above the 100-day EMA and push up back towards 2,785 – a level that has capped the index’s advance twice over the last six weeks. On the other hand, stock market bears will be looking for a failure or false break-out at the 100-day EMA followed by a retest of the 200 EMA around 2,600. A break below here opens up the possibility of a retest of the February lows around 2,530. Whichever way the market goes now, it appears that the stock market volatility genie is out of its bottle. That would suggest a more challenging investing environment, but one much better suited to traders than we’ve seen over the last few years.